" The fish here is quite a lot, starting from tilapia fish, catfish, gold fish, catfish, and cork. 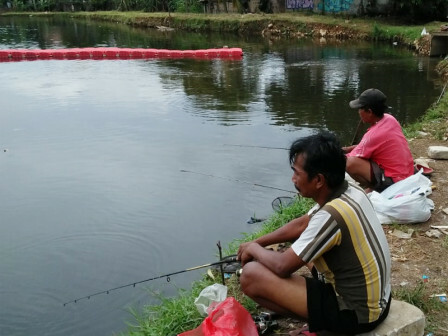 Moreover it's free"
For those of you who have a hobby of fishing, you can come to one of the free fishing spots in East Jakarta, namely Rawa Babon Reservoir, which has an area of six hectares. Based on beritajakarta.id report, Monday (3/11), dozens of people seemed to pack the side of the reservoir armed with fishing rods. As experienced by Didi Kusnadi, one of the reservoir visitors who often come to the reservoir for fishing, whereby he is able to come up to four times in a month. "The fish here is quite a lot, starting from tilapia fish, catfish, gold fish, catfish, and cork. Moreover it's free," expressed a citizen living in RW 09, Kelapa Dua Wetan Urban Village, Ciracas. Similar statement also came from another visitor, Muhidin (42). Besides its location near his home in Ciracas, he also often comes for fishing every day. "I just simply use worm and moss bait. If it is rain, I usually wear a raincoat. Moreover, this place is cozy and shady for fishing," he told.